A relentlessly inventive collection of myths that betray a deep love and respect for the natural world, the "Penguin Classics" edition of Rudyard Kipling's "Just So Stories" is edited with an introduction by Judith Plotz and a general preface by series editor Jan Montefiore. 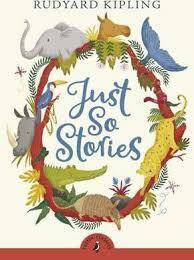 In these bewitching stories we learn "How the Camel got his Hump", "How the Leopard got his Spots" and "How the Whale got his Throat", as Rudyard Kipling conjures up distant lands, beautiful gardens of splendid palaces, the sea, the deserts, the jungle and all its creatures. Inspired by Kipling's delight in human eccentricities and the animal world, and based on bedtime stories he told to his daughter, these strikingly imaginative fables explore the myths of creation, the nature of beasts and the origins of language and writing. They are linked by poems and scattered with Kipling's illustrations, which contain hidden jokes, symbols and puzzles. Among Kipling's most loved works, the "Just So Stories" have been continually in print since 1902. Part of a series of new editions of Kipling's works in "Penguin Classics", this volume contains a General Preface by Jan Montefiore and an introduction by Judith Plotz exploring the origins of the stories in Kipling's own life and in folklore, their place in classic children's literature and their extraordinary language. Rudyard Kipling (1865-1936) was born in Bombay. In 1882 he started work as a journalist in India, and while there produced a body of work, stories, sketches and poems - notably "Plain Tales from the Hills" (1888) - which made him an instant literary celebrity when he returned to England in 1889. His most famous works include "The Jungle Book" (1894), "Kim" (1901) and the "Just So Stories" (1902). Kipling refused to accept the role of Poet Laureate and other civil honours, but he was the first English writer to be awarded the Nobel Prize, in 1907. If you enjoyed "Just So Stories", you might like "Selected Tales by the Brothers Grimm", also available in "Penguin Classics".